The Hartz (r) Advanced Care (tm) 2 in 1(r) Flea & Tick Collar kills both ticks and fleas for 5 months. It kills the Rocky Mountain Wood Tick, carrier of Rocky Mountain Spotted Fever, and the Deer Tick which may carry Lyme Disease. These collars are available in various colors and are waterproof. Swimming, rain and getting them wet do not reduce efficacy. For use on kittens 12 weeks of age or older. Harmful if swallowed or absorbed through skin. Causes moderate eye irritation. Avoid contact with eyes, skin, or clothing. Wash thoroughly with soap and water after handling and before eating, drinking, chewing gum, or using tobacco. First Aid If Swallowed: Call a Poison Control Center or doctor immediately for treatment advice. Have person sip a glass of water if able to swallow. Do not induce vomiting unless told to do so by a Poison Control Center or doctor. Do not give anything by mouth to an unconscious person. Note to Physicians and Veterinarians: This product contains an organophosphate and may cause cholinesterase inhibition. Cholinergic symptoms may include salivation, miosis, incoordination, muscle fasciculation and/or weakness, vomiting and diarrhea. Atropine is antidotal. 2-PAM may be effective as an adjunct to atropine. Call 1-800-275-1414 or your local Poison Control Center for further information. Remove collar from package, unroll and stretch to activate insecticide generator. Do not use on kittens under 12 weeks of age. Do not unroll collar until ready to use. 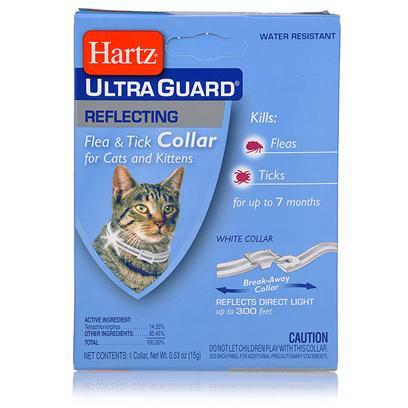 Place the Hartz Ultra Gurard Reflecting Flea & Tick Collar for Cats around the cat's neck, adjust to a proper fit and buckle in place. The collar must be worn loosely to allow for growth of the cat and to permit the collar to move about the neck. Generally, a properly fitted collar is one that when fastened will snugly slide over the cat's head. Leave 2 or 3 inches on the collar for extra adjustment and cut off and dispose of extra length. Consult a veterinarian before using this product on debilitate, aged, medicated, pregnant or nursing animals. Sensitivities may occur after using ANY pesticide product for pets. Some animals may become irritated by any collar if it's applied too tightly. If this occurs, loosen the collar and bathe your pet with mild soap and rinse with large amounts of water. If signs continue, consult a veterinarian immediately. Do not use this product on animals simultaneously or within 30 days before or after treatment with or exposure to cholinesterase inhibiting drugs, pesticides, or chemicals. However, flea & tick collars may be immediately replaced.